Hanoi (VNA) - The Ministry of Industry and Trade (MoIT) has suggested the State Bank of Vietnam clear, reschedule or put off debts for farmers who have been affected by the worst drought and saltwater intrusion in the country in almost a century. This is a part of the ministry’s recommendations to the Government and nine other ministries on actions to boost the country’s exports in the second half of this year. For the first time in a decade, Vietnam has seen negative growth in agriculture when the agriculture growth rate dropped 0.18 percent in the first half of this year. According to the ministry, the serious drought and saltwater intrusion occurred from the middle of March until May in the southern part of the central regions, Central Highlands and Mekong Delta region. The Department of Agricultural Economy under the Ministry of Planning and Investment, which conducted an assessment of the drought, said the historic natural disaster has taken a heavy toll on agricultural production. Thousands of hectares of fruit, rice and sugar crops have been destroyed. It is estimated that nearly 250,000 hectares of paddy fields have dried up, and the national rice output is likely to fall this year for the first time since 2005. The Mekong Delta’s winter-spring output fell 10.2 percent from last year, but total production could fall by just 1.5 percent to 44.5 million tonnes this year. In the Central Highland region and south-eastern provinces, 16,000ha and 28,000ha, respectively, of industrial crops like rubber, coffee and pepper suffered water shortages. 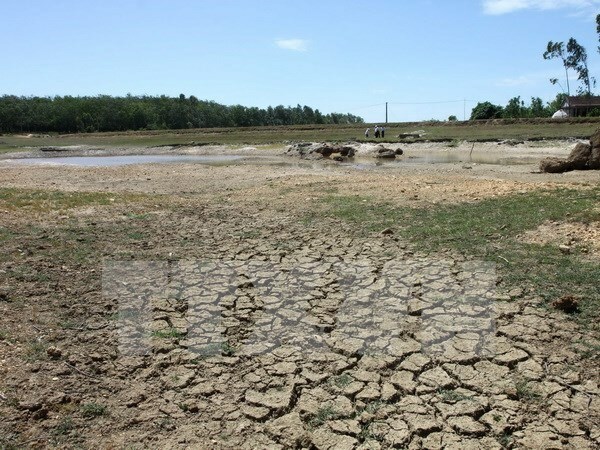 The drought and saltwater intrusion has cost Vietnam an estimated 15 trillion VND (670 million USD) so far this year in agricultural losses, according to a government report in late May. The MoIT also brought up the massive fish death environmental incident in the four coastal central provinces of Ha Tinh, Quang Binh, Quang Tri and Thua Thien-Hue, that froze almost all fishing activities, aquaculture trade and tourism. The ministry said that financial incentives for disaster-hit farmers are urgent at this time. About 60 percent of Vietnam’s workforce and households work in agriculture and face major difficulties including small production size, low productivity and being vulnerable to the impacts of climate change and natural disasters. In particular, the ministry proposed that the State Bank offer lower interest loans for farmers to re-plant coffee.